The Battle of Hastings took place eight miles north of the town on Seniac Hill. The charming town of Battle grew around nearby Battle Abbey. This was built to commemorate the victory that happened in 1066. The estimate is that 17,000 people fought and four thousand died. The success of William the Conqueror had consequences for Britain that continue. England is split between failed Scandinavia in the North and imitation France in the South. Hastings belongs to the Cinque Ports, the five harbours that were linked by Edward the Confessor to defend his kingdom. The five ports provided a naval fleet. 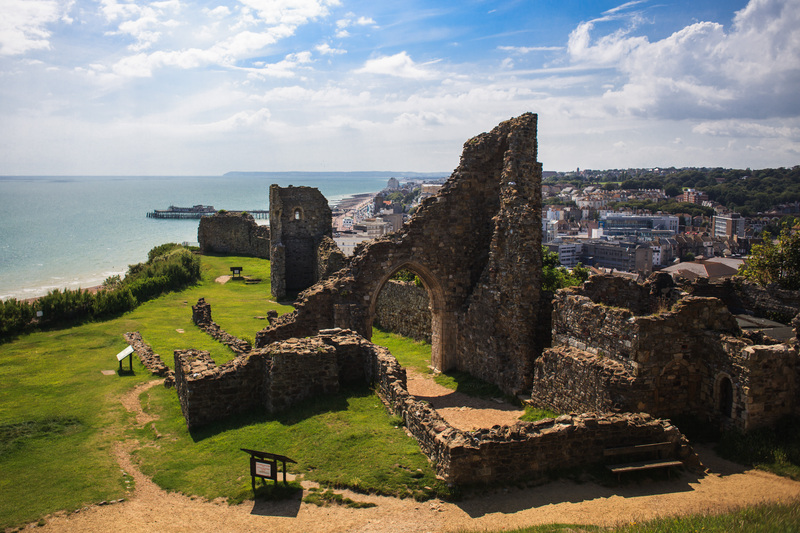 Before railways and 19th Century tourism, Hastings relied on fishing and smuggling. Today the tourism has faltered and, despite initiatives like low carbon industrial estates, Hastings has the worst unemployment in Southern England. Low pay jobs in tourism attracted migrants but their numbers peaked in 2007. Late at night young migrants would have cheap after work celebrations on the promenade. Sharing cans of lager and cigarettes, they looked like people obliged to contemplate an error. Unlike the seven car parks, the promenade is CCTV free. Operated by staff in a remote single room, Hastings has a CCTV code of practice. On a bad day, when the CCTV unaware tourists gather like the decrepit defeated, the hotels on the promenade look as if they are expecting a gentle apocalypse. If history is an existential buffer against time, the interesting yet dated art deco modernism of Hastings is no more than a cracked bumper. Monuments, though, are still monuments. 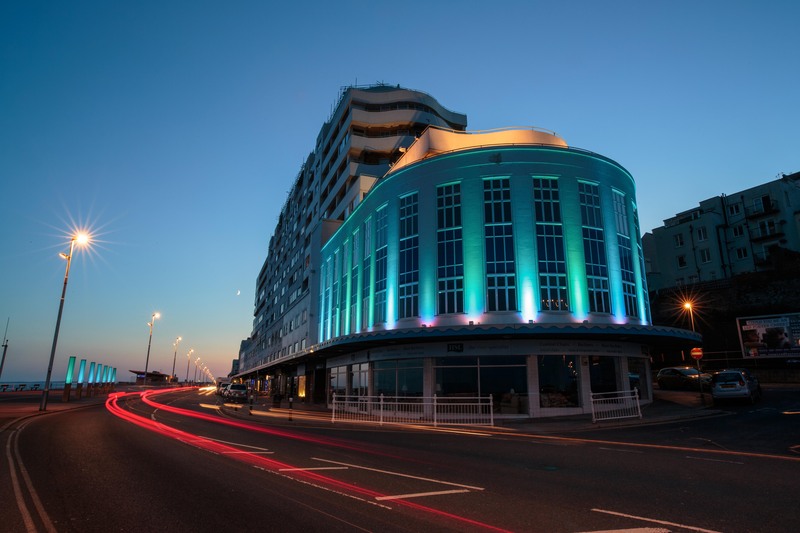 Marine Parade resembles an ocean liner and is defiant architecture and grand, a reminder of when promise and arrogance where defined by the telegram and the radio. More modest are the art deco bus stops of Hastings, the ice cream parlour and the entrance to Hastings Pier. Even McDonalds has an art deco entrance. All are defined by sharp lines that emphasise what was once thought to be the modern aesthetic. The ruins of the castle exist as a traditional alternative and their location, east of the town on cliffs that are high by southern standards, is splendid. The Saxon Shore Way is the coastal path that links Hastings to Gravesend in Kent. Throughout its 163 miles the scenery is varied, urban and rural it has wide flat estuaries and high chalk cliffs. Flamingo Park is an old-fashioned fairground that is open all the year and is a perfect winter retreat for absent fathers and their children. The miniature railway is forty years old but the art deco influences are minimal. Hastings is 53 miles from London and has a population of 91,000 people. The town has produced actors, singers, comedians and independent rebels. David Hare wrote the marvellous Licking Hitler and the famous playwright from Hastings has exposed and ridiculed the British class system as well as any. The Stables Theatre of Hastings has a repertory that by coastal standards is provocative. This month the Theatre staged Ann Boleyn by radical polemicist, Howard Brenton. In June the Drama Group of Chicago Heights performs Cat On A Hot Tin Roof. Modernism may lack resonance but art deco and performers from the Southside of Chicago constitute a cool that can ignore previous invasions. Posted in Ann Boleyn, art deco, Battle of Hastings, Cat On A Hot Tin Roof, David Hare, Drama Group of Chicago Heights, Flamingo Park Hastings, Gravesend Kent, hastings, Howard Brenton, Licking Hitler, Saxon Shore Way, Stables Theatre, William the Conqueror and tagged Culture, history, tourism, travel, United Kingdom on May 30, 2015 by Howard Jackson.